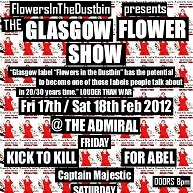 Glasgow record label / multi media collective Flowers In The Dustbin launch their mini documentary ‘THE GLASGOW FLOWER SHOW’ with a 15 minute ‘propaganda edition’. The documentary features Flowers In The Dustbin artists, handpicked guest artists, plus bloggers, journalists, djs and audience members. It is a record of a 2 day live event, and a snapshot of the Glasgow underground music scene. Flowers In The Dustbin believes in these undiscovered gems. They are our inspiration.